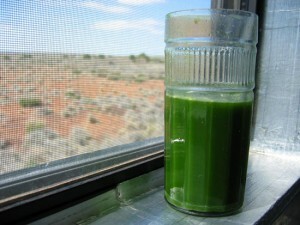 This green veggies and sprouts juice provides a protein-packed jumpstart for your day. 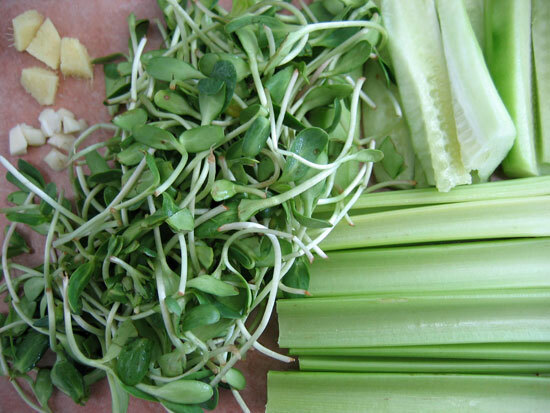 Cucumbers and celery give a light mineral-rich base while the sunflower sprouts add protein, vitamins A, B complex, D, and E, plus potassium, calcium, magnesium, and iron. For a spicy bite, throw a garlic clove and small piece of ginger into the mix. Add a handful of chopped pea shoots, spinach, kale, and other greens as you wish. Add a carrot, apple, beet, or other sweet vegetable or fruit to sweeten it up. Remember that the sugar is concentrated in fresh juice and err on the side of caution, especially if you have blood-sugar issues. Clean and prepare all ingredients. Bless your juice and drink.